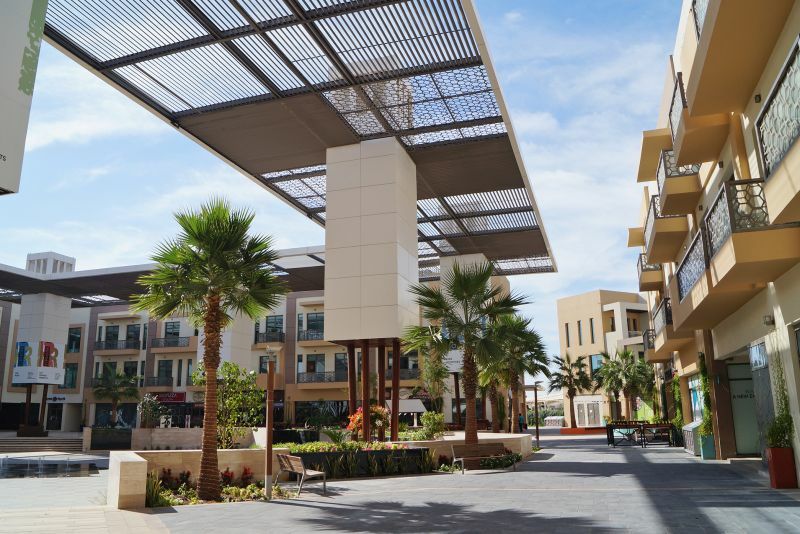 The Sustainable City is a 46-hectare (113-acre) residential development in DubaiLand, situated on Al Qudra Road, about 20-minutes’ drive from Al Maktoum International Airport. 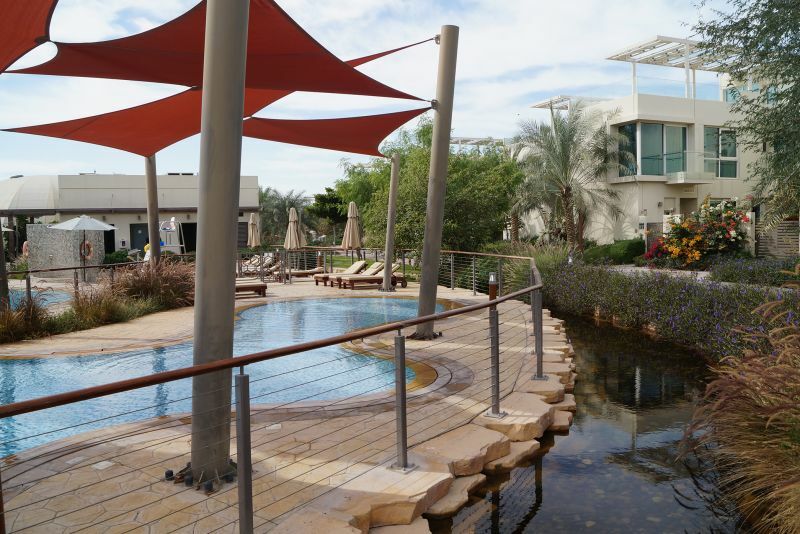 Home to 498 villas and 89 apartments, with a population of 2,700 residents, this place has put into practice all the theories of social, economic and environmental sustainability in the built environment. 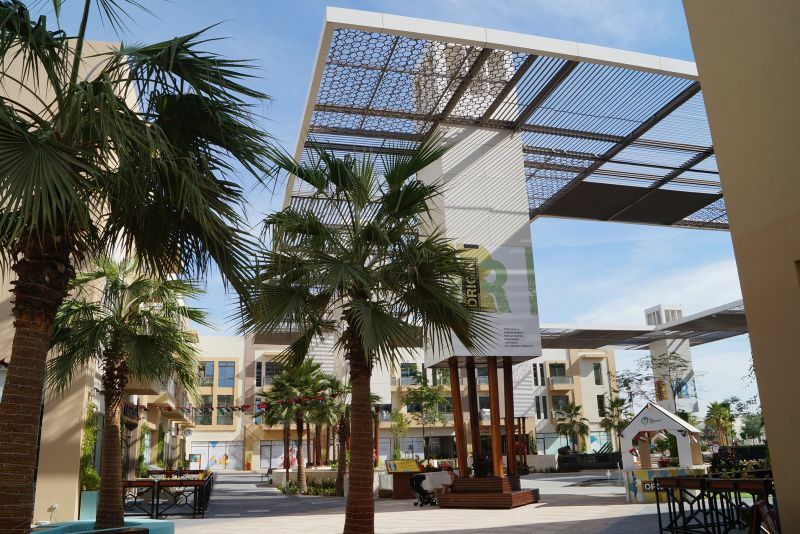 It is the first operational Net Zero Energy city in Dubai, and is expected to become an international showcase for sustainable living, work, education, and recreation. 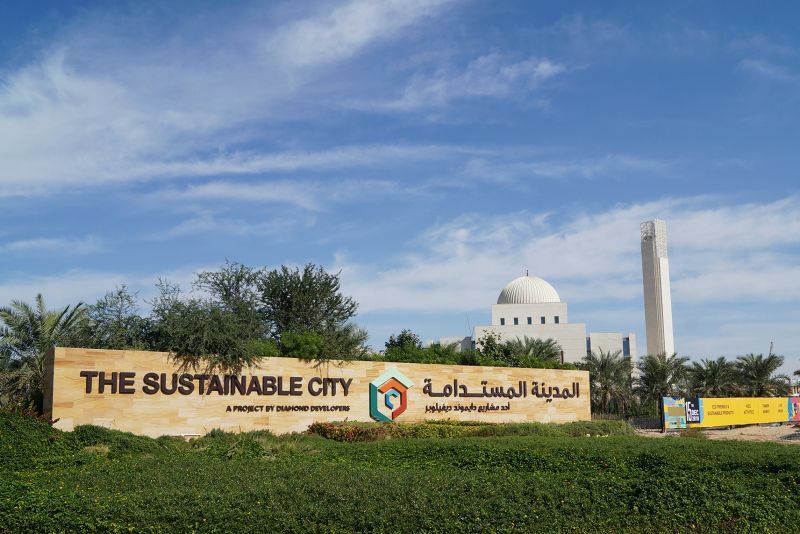 The Sustainable City includes various land‐uses such as residential, commercial, educational, urban farming, leisure, health care and The Diamond Innovation Centre. 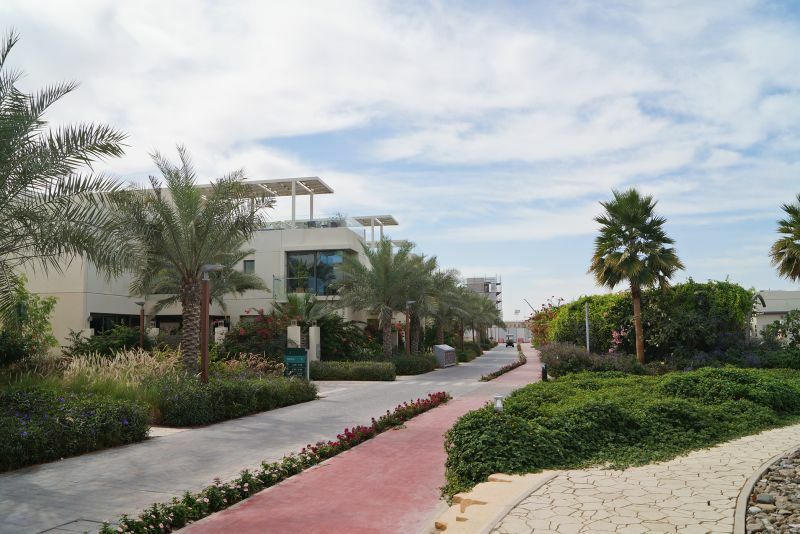 One-click links to properties currently on the market in Dubai Sustainable City. 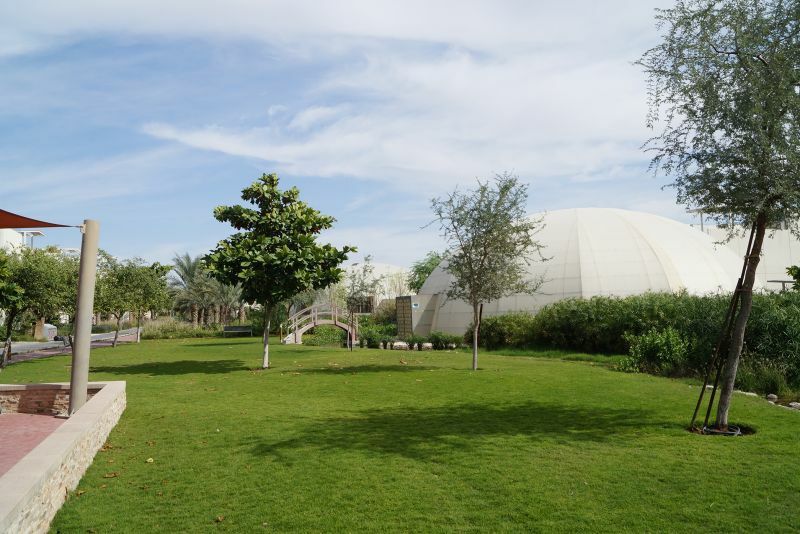 The Sustainable City is surrounded by a 30-metre wide tree belt which helps to reduce air and noise pollution whilst at the same time forming an important ecological habitat. The 2,500 trees are arranged in three layers up to ten metres high. The outer layer cuts down noise and dust, and provides shade for the bridle path. 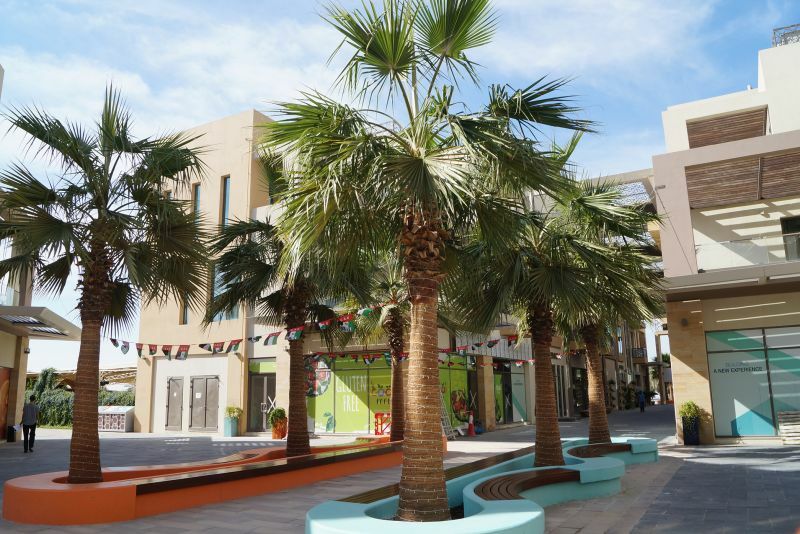 The middle layer provides shade for cycle track, while the inner layer of date palms is part of the city’s ‘productive landscape’. 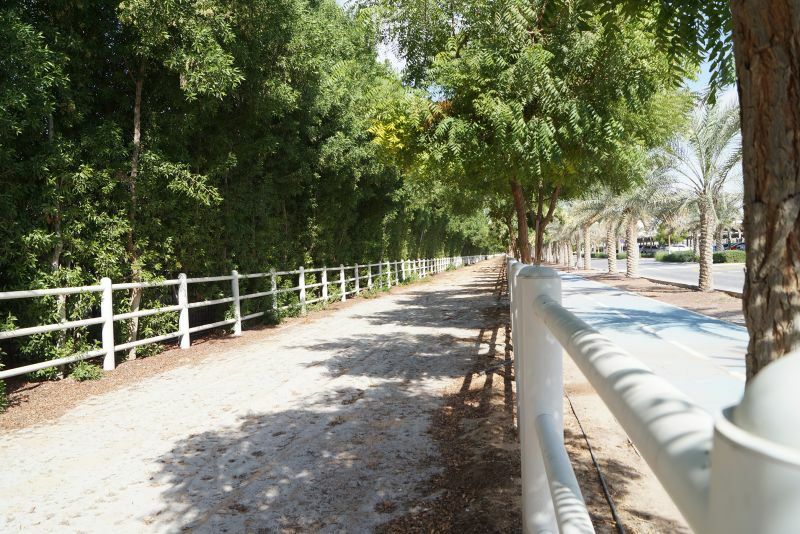 The bridle path, managed by The Sustainable City Equestrian Club, runs for four kilometres and may be used by residents and visitors. 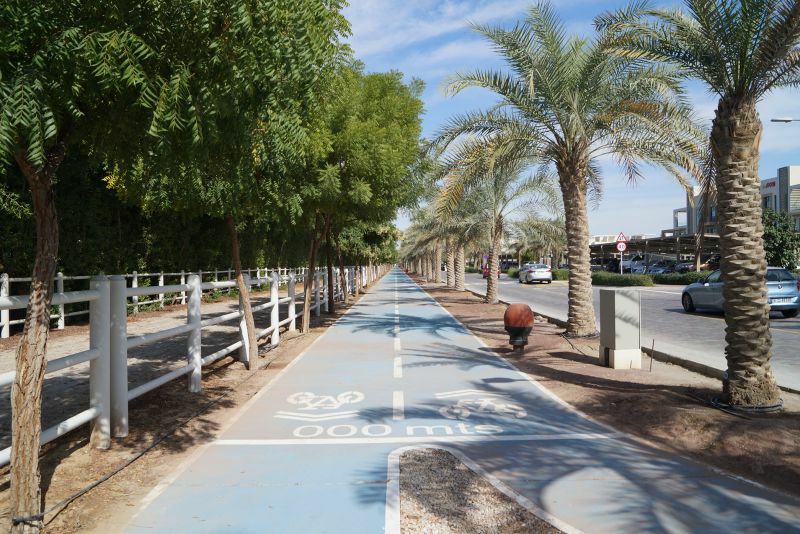 A cycle track of similar length is separated from the carriageway by a “bios wale” which collects and filters storm water runoff. The carriageway is laid with interlocking pavers to allow for some permeability for storm water. On the residential side of the carriageway there is a five-kilometre rubberized jogging track to encourage an active lifestyle. 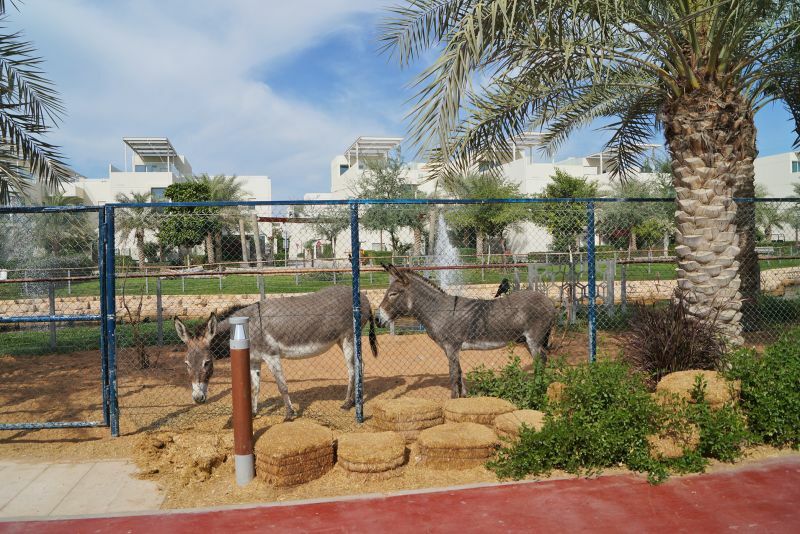 The Sustainable City Equestrian Centre will offer residents quality riding classes from three-years of age to adults up to the intermediate level. The centre will offer 30-minute lessons for beginners and 45-minutes for intermediates. 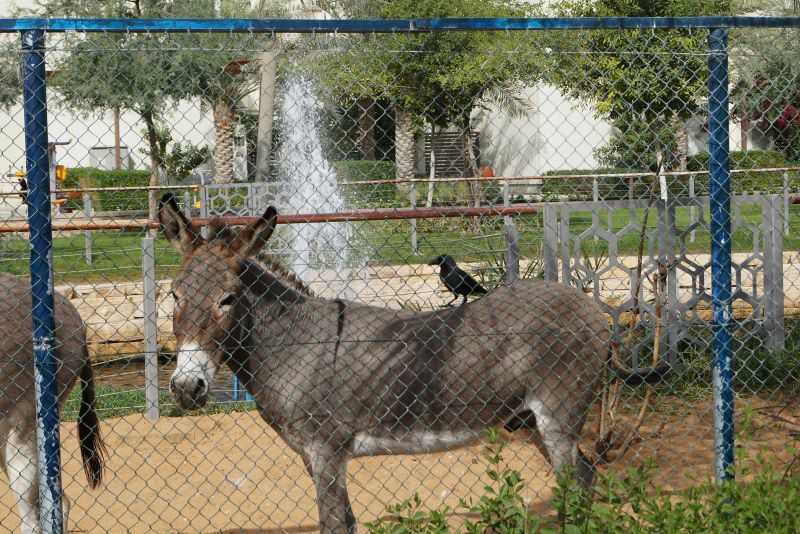 The centre will have 32 well-schooled Arabian, thoroughbred and mix-breed horses. Experienced instructors and trained grooms will look after the horses and also guide younger riders on lead reins. The Equestrian Centre will also offer after school activities to schools, to include half an hour of stable management and half an hour horse riding. 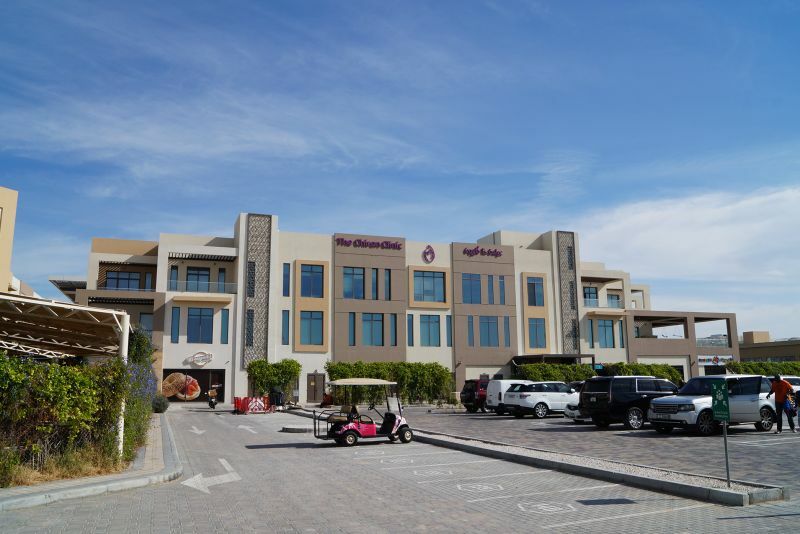 The new facility will offer trail rides along with the four kilometre sand track, daily pony rides and carriage services for wedding ceremonies, birthday parties and even photo shoots. 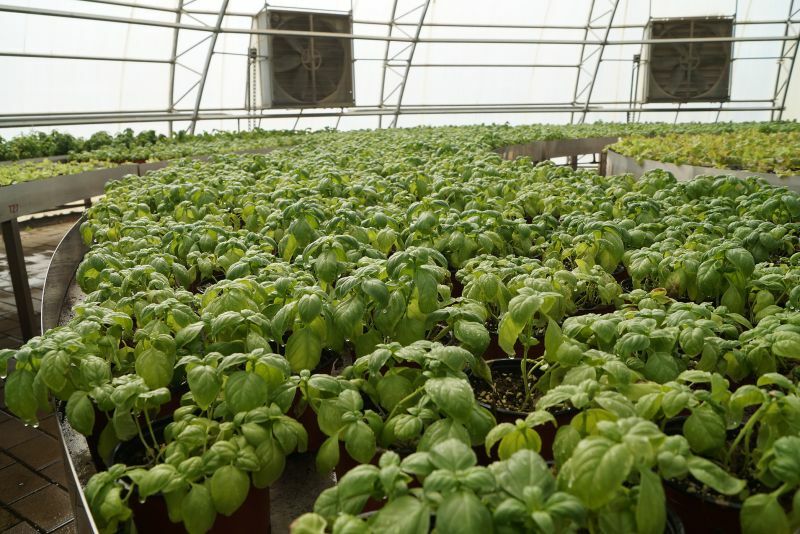 There are 11 bio-dome greenhouses running the length of the spinal park which runs through The Sustainable City. 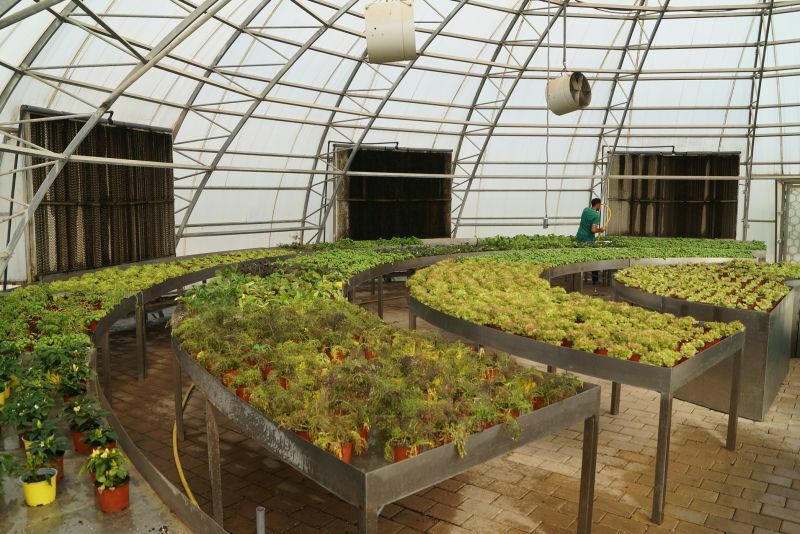 Known as The Farm, these greenhouses have a total capacity of over 3,000 square metres and the plan is to diversify and grow as many fruits and vegetables as possible in these domes and on the green spine. 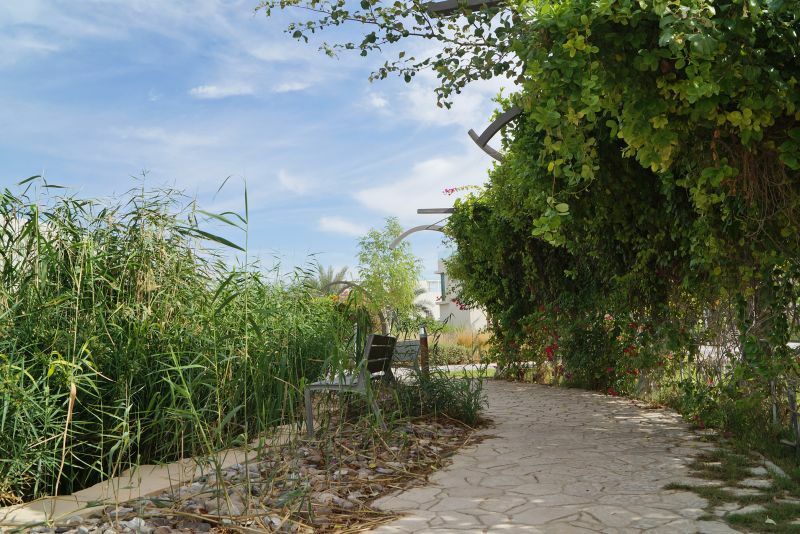 The park also contains roughly one hectare of outdoor permaculture gardens, offering opportunities for interested residents to become involved in community farming groups. 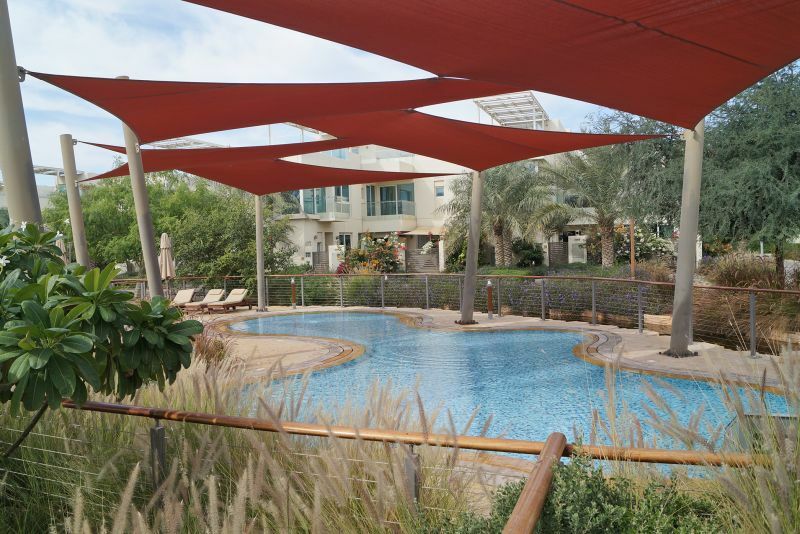 The spine is irrigated with recycled greywater that has been collected from the villas and treated in an underground treatment facility. 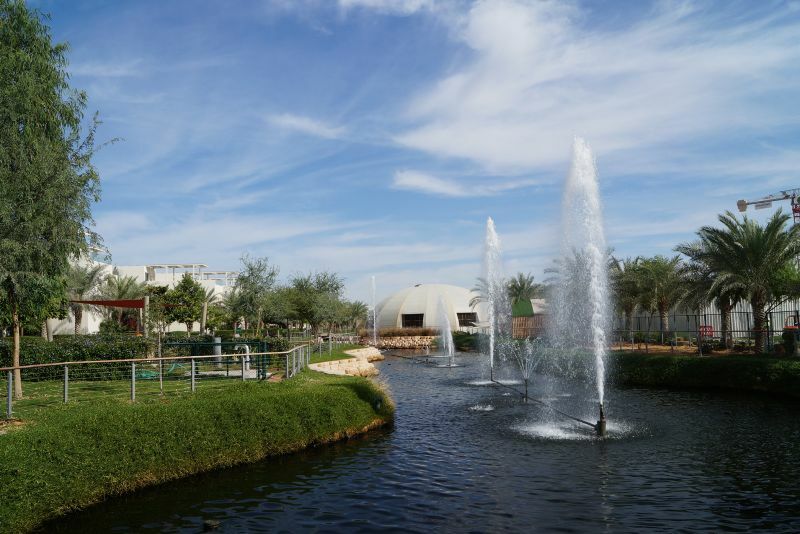 The resultant clean water is then circulated through a series of lakes and streams that flow along the length of the The Farm through irrigation channels known locally as ‘falaj’. 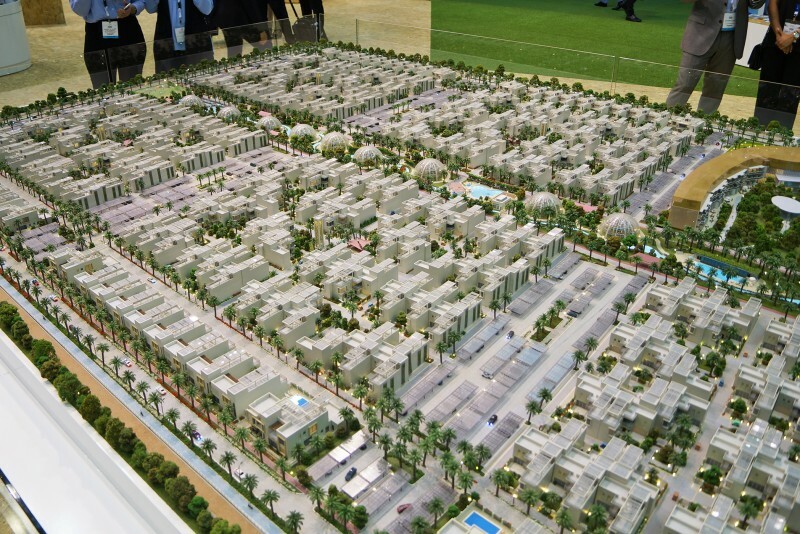 The Sustainable City comprises five residential clusters, housing a total of 498 villas. 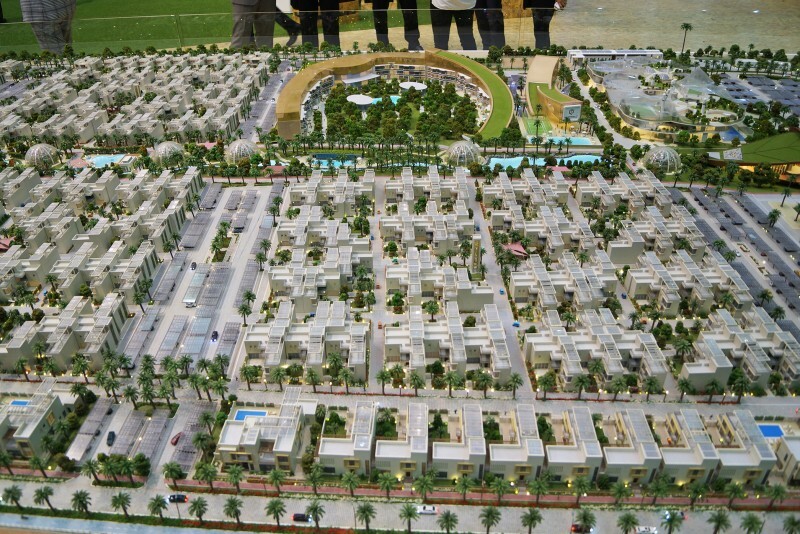 Connected to the Central Green Spine (or ‘urban farm’) that runs the length of the City, each cluster contains 90 Courtyard Villas, eight Garden and two Signature villas. 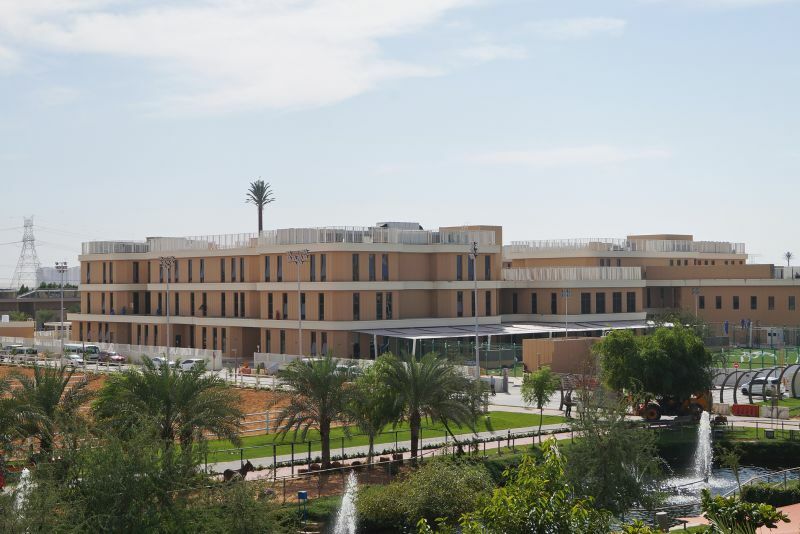 The cluster are named after types of date palms: Lulu, Berhi, Hilali, Jabri and Khalas. The L-shaped, two-storey villas combine ergonomic excellence with contemporary design to meet the highest environmental performance standards. 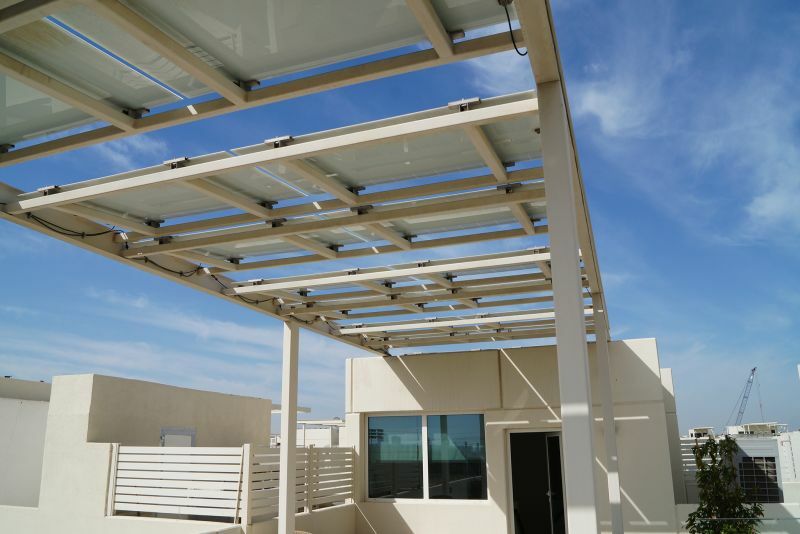 The third and top floors provide ample roof terraces, much of which is shaded by the homes’ unobtrusive solar panels. Courtyard villas range in size from 312sq m (3,362sq ft) to 357sq m (3,850sq ft), including comfortable staff accommodation. 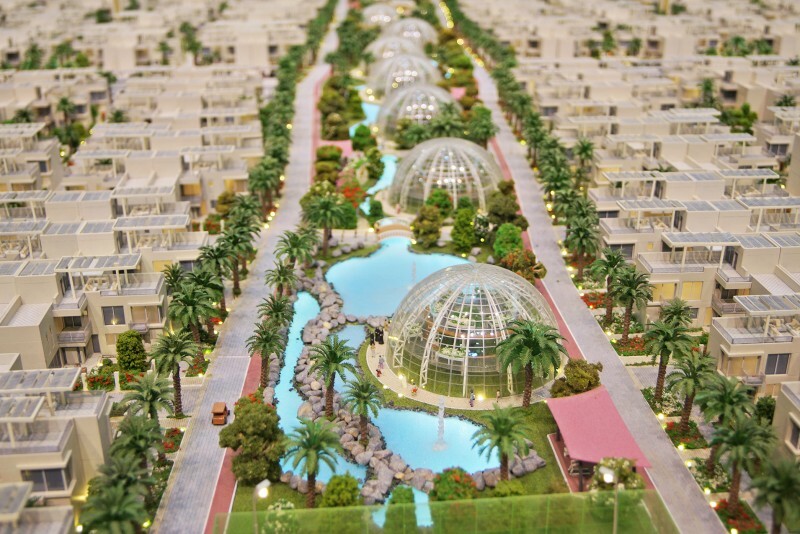 Garden villas measure 477sq m (5,140sq ft) and Signature villas measure 743sq m (8,000 sq ft). 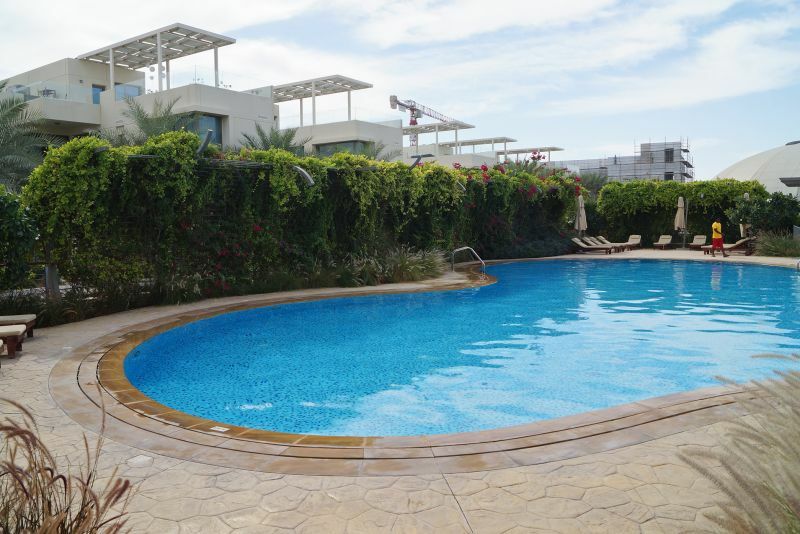 All villas are fitted with Star-rated energy appliances and LED lighting throughout and the gardens are ready landscaped. 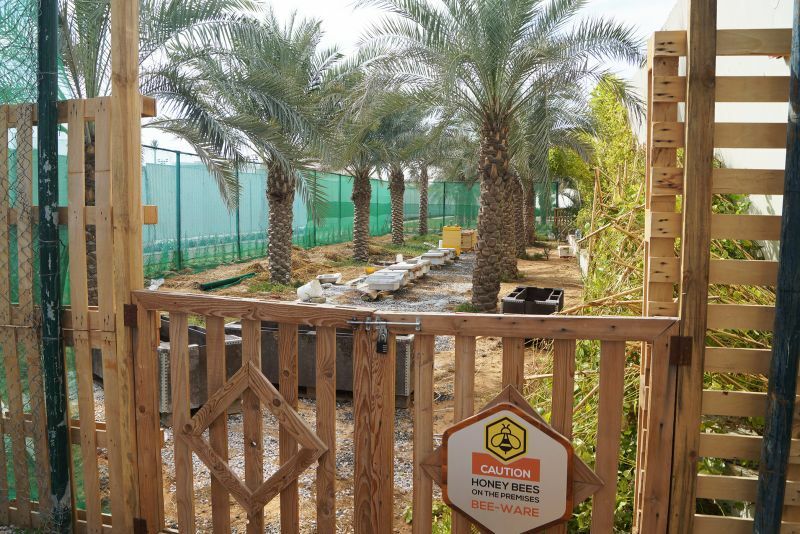 Several recycling stations are located in each cluster, encouraging residents to segregate waste in keeping with Dubai’s eco-friendly waste management policies. 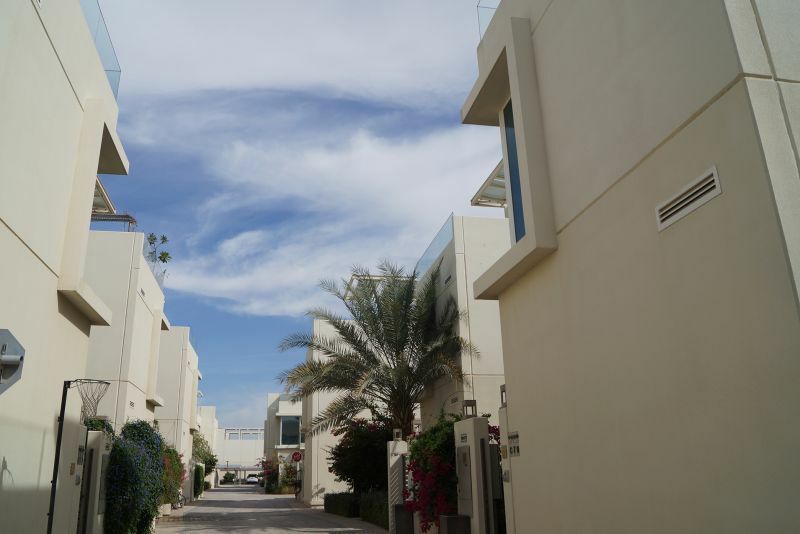 The residential clusters are car-free zones, so the Courtyard villas are only accessible on foot or by electric buggies - through narrow, shaded streets (sikkas) that link the city together. This significantly reduces noise, pollution and hazards whilst at the same time providing a safe environment for children to play. 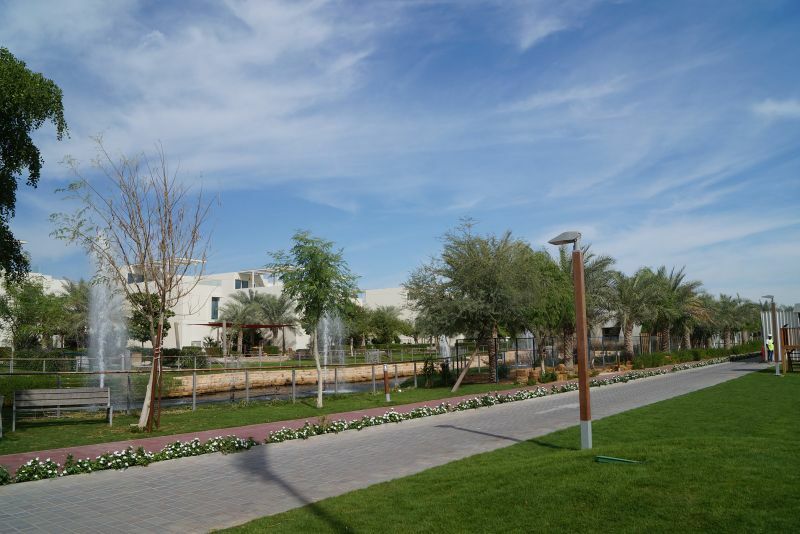 All villas are within easy walking distance of the Central Green Spine, which helps to create a community atmosphere. 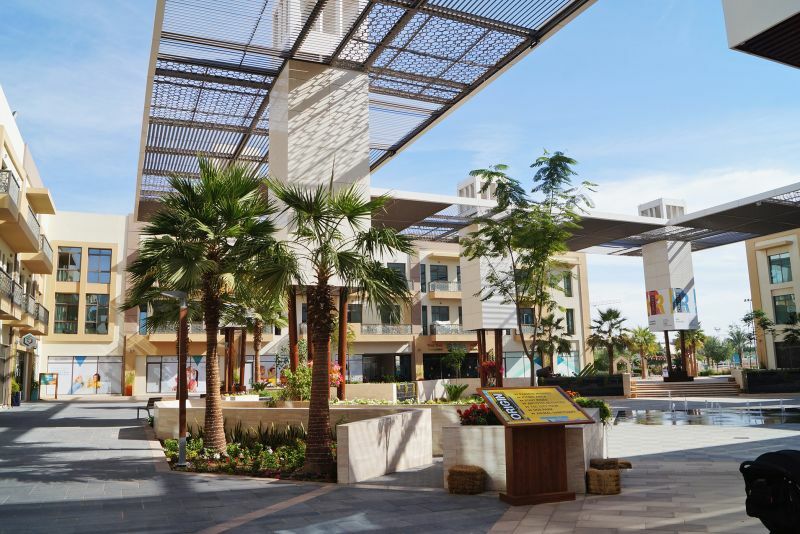 In keeping with The Sustainable City’s ethos of a family-friendly environment, each residential cluster offers four amenity plazas with one central plaza housing a cooling tower to maximize the outdoor space. 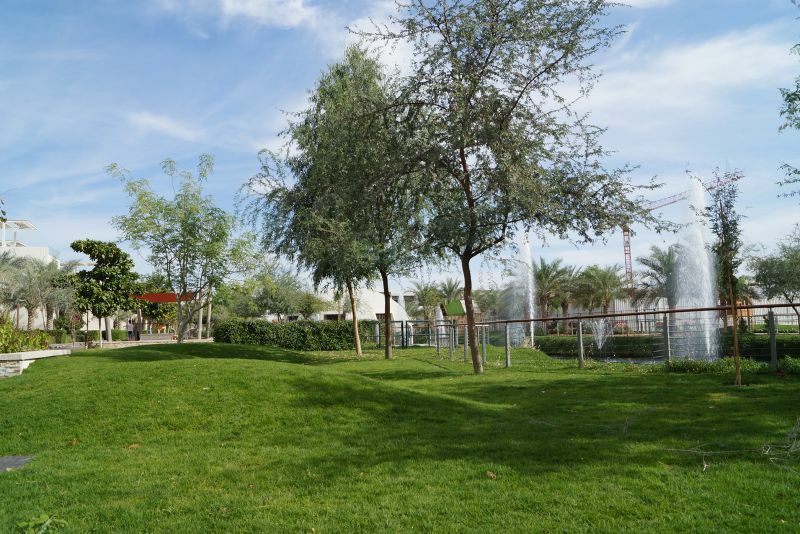 Others offer shaded communal gardens with seating and playgrounds for children. The Sustainable City provides shaded car parks throughout the city. 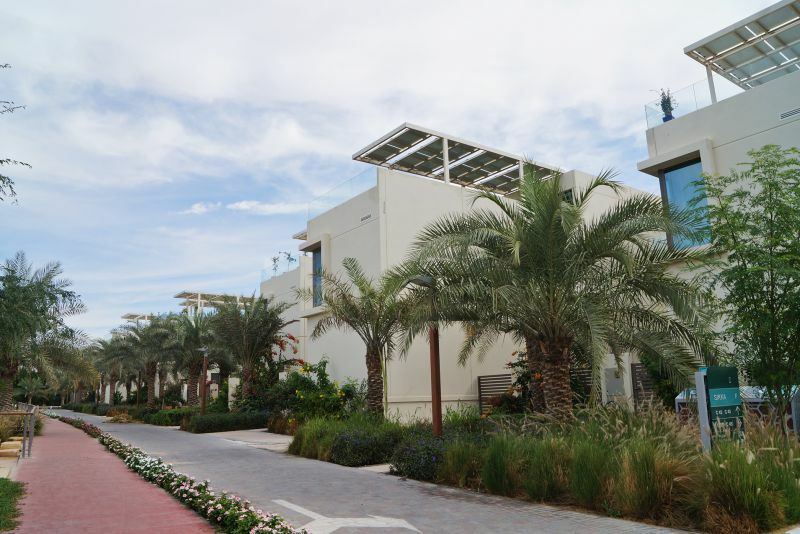 Each villa has two parking spaces shaded with solar panels plus additional spaces for communal electric buggies. 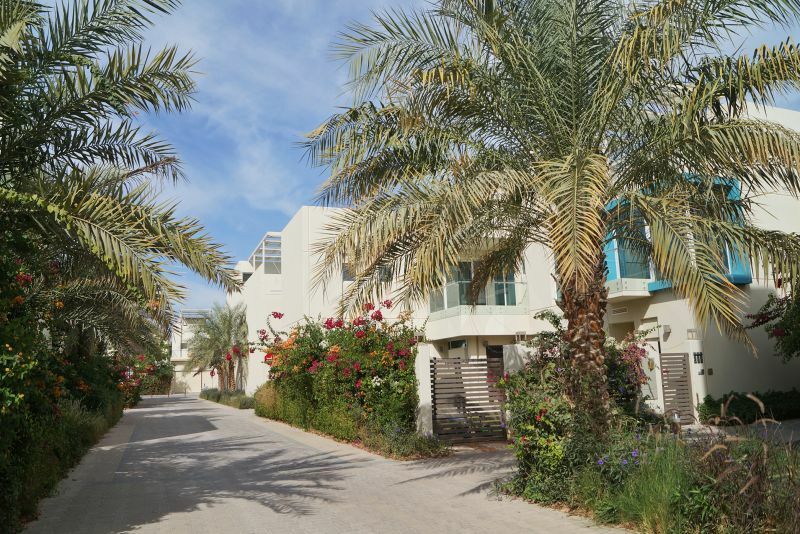 The walking distance from the car parks to the villas ranges from 10 to 85 metres. The solar panels produce about 3MW peak solar energy, enough to power street lighting, electric vehicle charging stations, greywater treatment and the urban farm. This energy is free, thereby helping the city achieve a NET ZERO service charge. 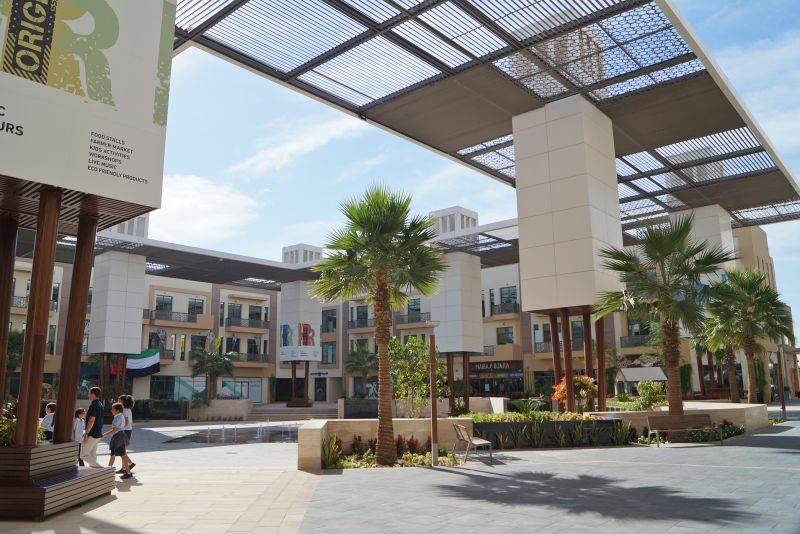 The Sustainable Plaza is a 15,000sq m mixed-use area near the entrance to The Sustainable City. 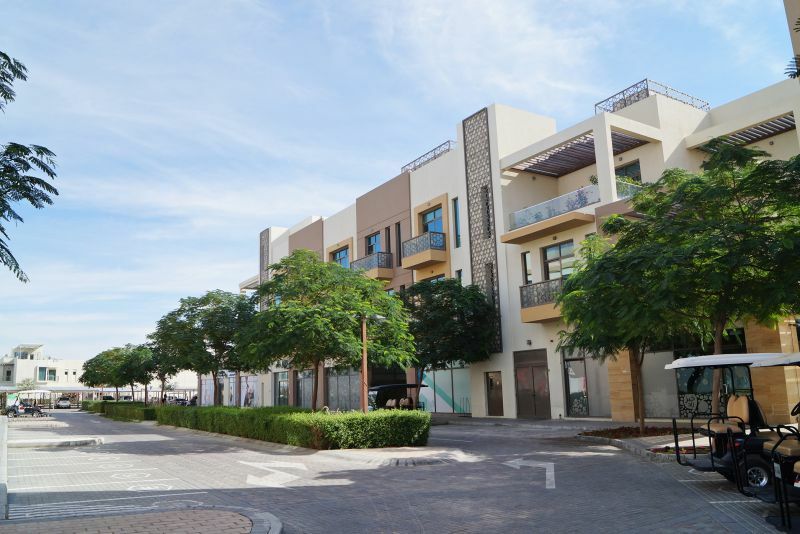 It comprises five four storey blocks with shops, restaurants, cafes, offices and leasehold apartments ranging from studios to one-and two-bedrooms. 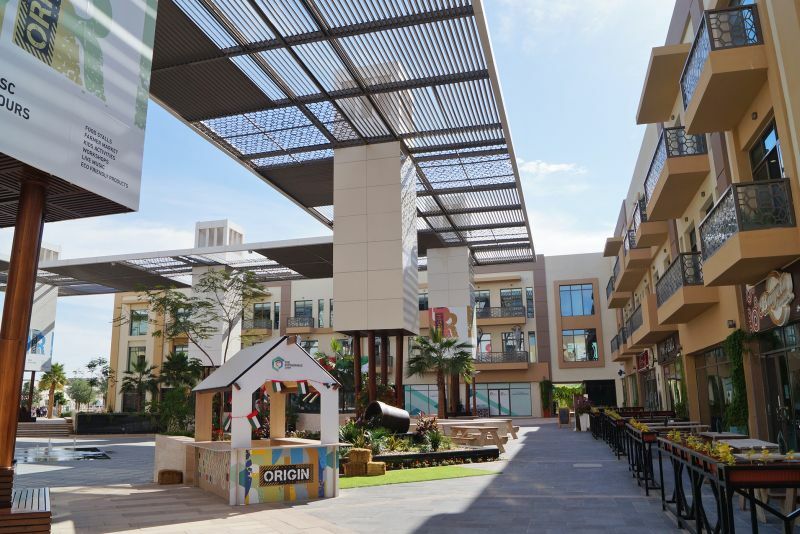 The shops are located on the periphery of the outdoor central plaza. 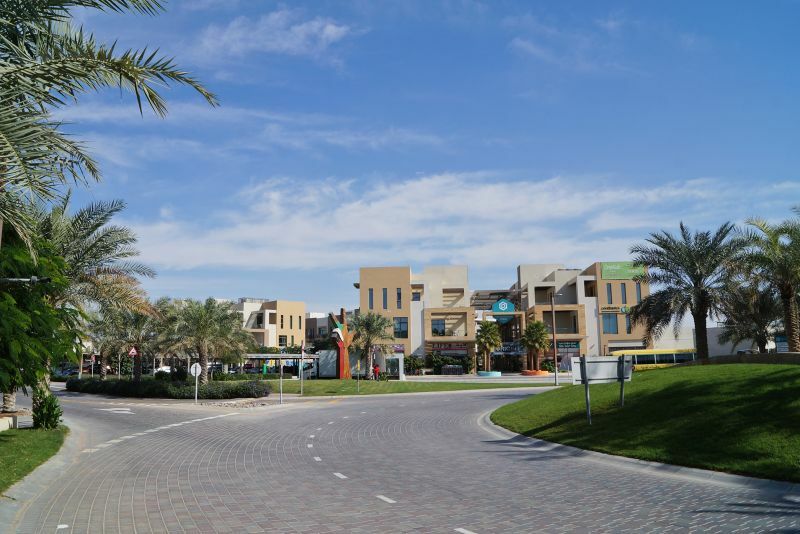 The aim is that they not only provide a necessary service for the resident community but also attract others in the DubaiLand area, thereby securing an additional income for the community. 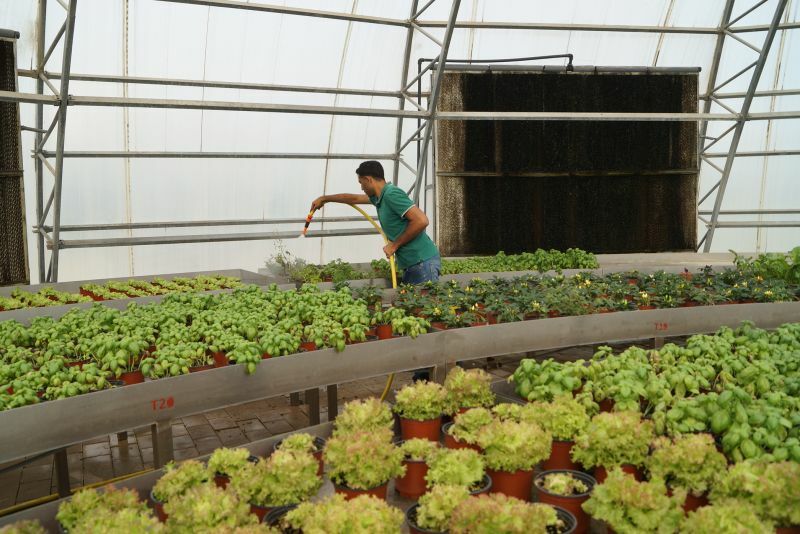 The restaurants will offer a range of cuisines from the Levant, Thailand, Mexico, Uruguay and USA, among others, and will be obliged to comply with the Green Restaurant Certification standards. 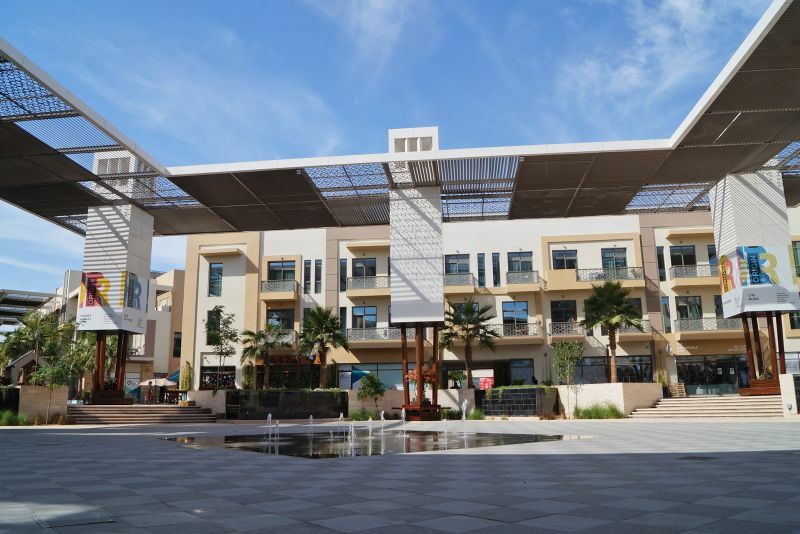 The Sustainable Plaza offices have attracted many reputed organisations and businesses, including the Emirates Wildlife Society/World Wide Fund (WWF). 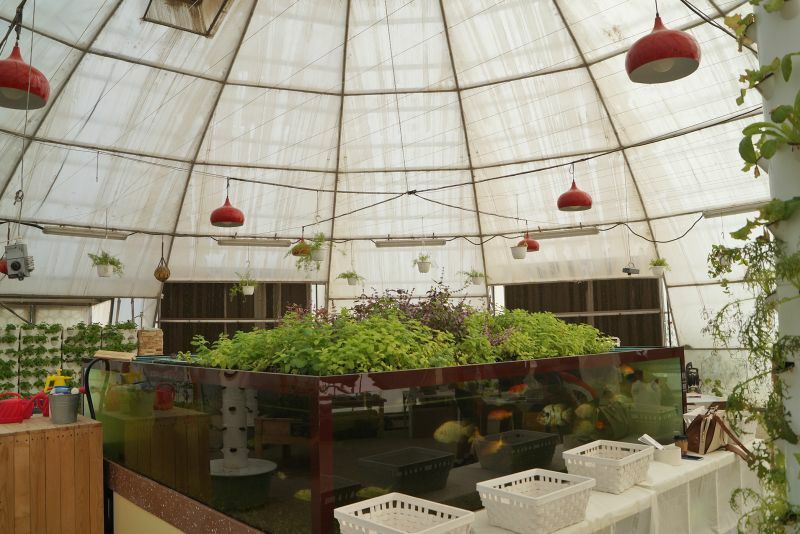 The Diamond Visitor Centre will organise tours of the City, and sell environmental products such as up-cycled apparel. 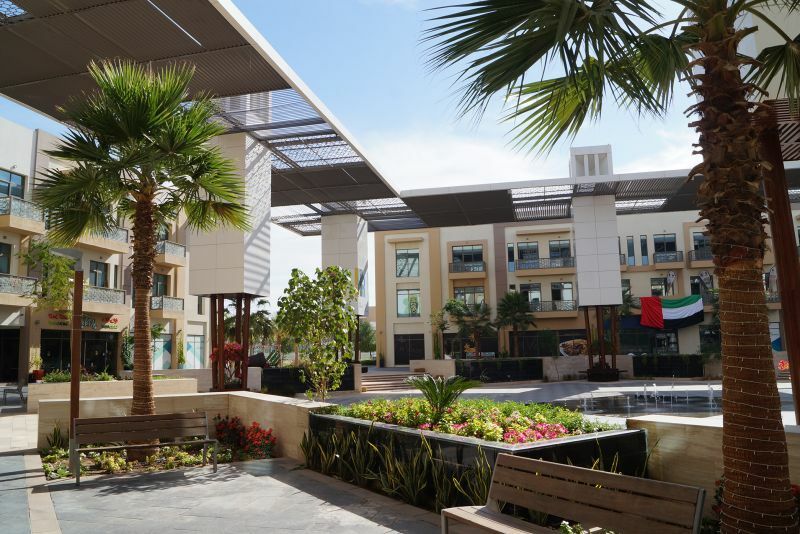 The courtyard area between the five buildings provides a suitable location for outdoor markets and stalls, which will encourage a market-style ambiance for shopping and relaxing. 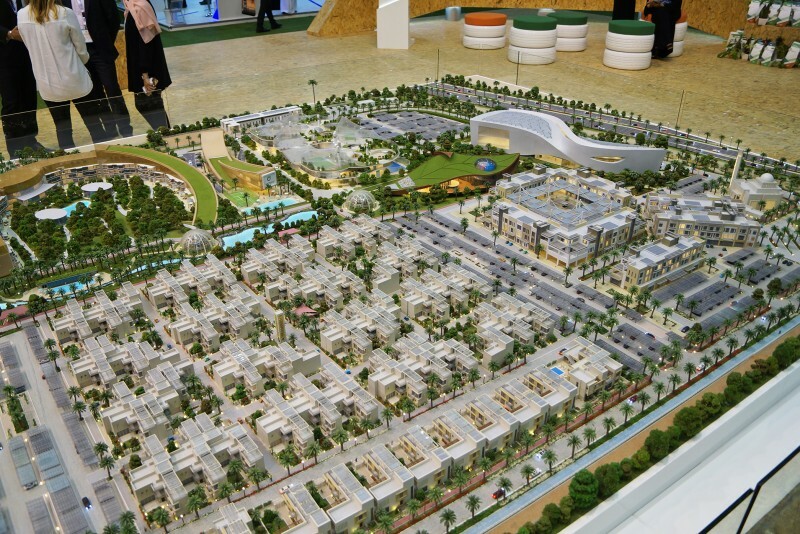 Mobility inside The Sustainable City supports Dubai’s low-carbon economic drive. The Sustainable City encourages its residents to rely less on motorised transport and more on solar-powered means of mobility, in addition to walking and cycling. 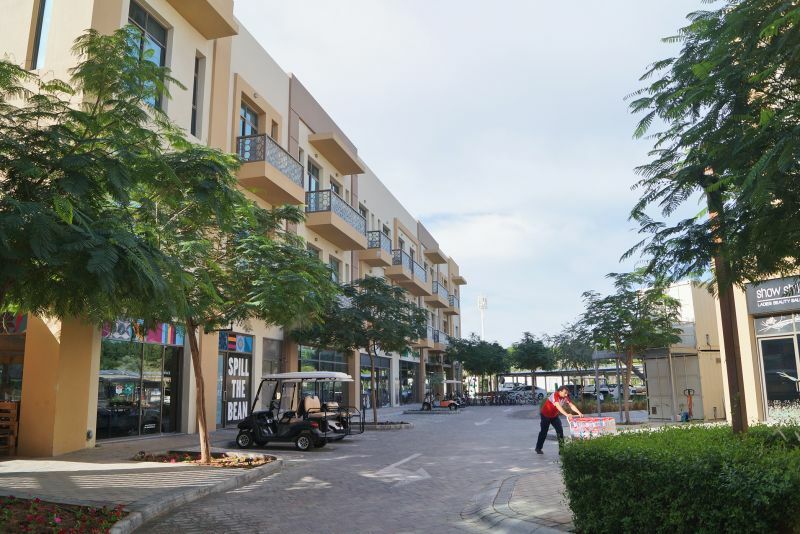 Features to enhance walkability include sikkas (narrow streets) and sidewalks throughout the community. 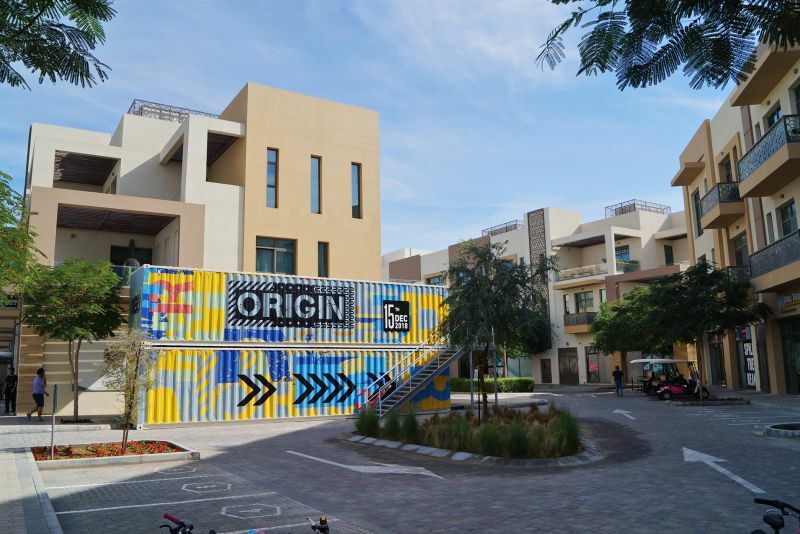 Each residential cluster has fully pedestrianised areas, while rubber tracks and cycle paths crisscross the City making it easier to go from one location to another. 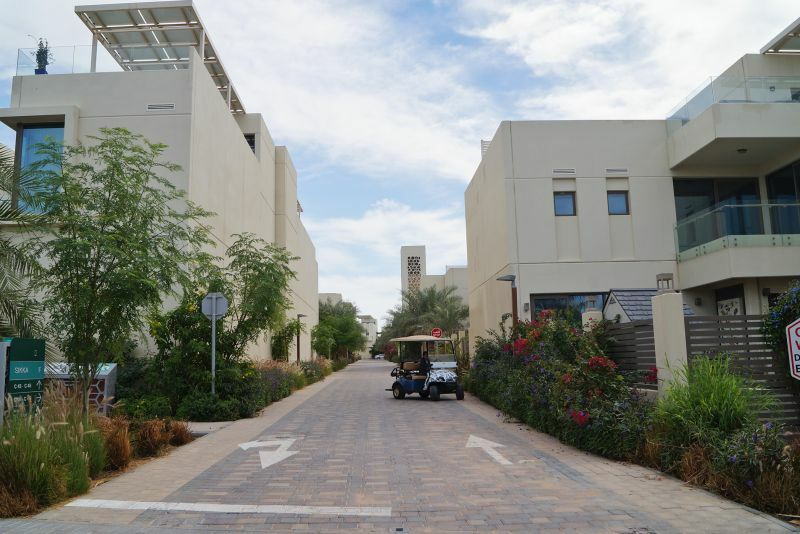 Two types of electric buggies are available for residents; concierge and communal. The concierge carts are staffed by trained drivers and are for the use of residents in situations where an extra hand is required – for example, when children are asleep, or groceries need to be carted home. The concierge service is free. Communal buggies are a shared resource for residents and are also free. Communal carts are distributed throughout the residential clusters and mixed use areas (Diamond Square) ensuring access for all residents. There is also an electric shuttle bus service to the residential clusters. The combination of these services provides a flexible and trouble-free commuting system for residents and visitors. It is also clean and green as the buggies are powered by solar panels. 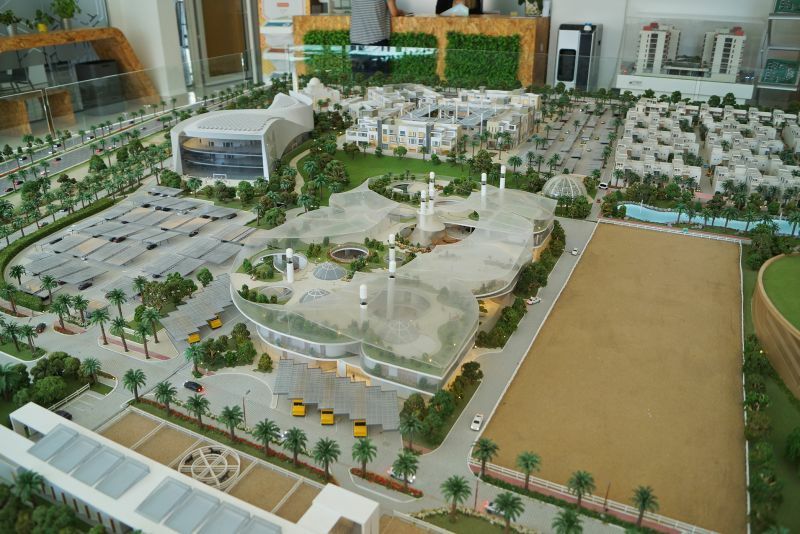 The Sustainable City Mosque can accommodate up to 700 worshippers and employs innovative design technologies to minimise energy and water consumption. 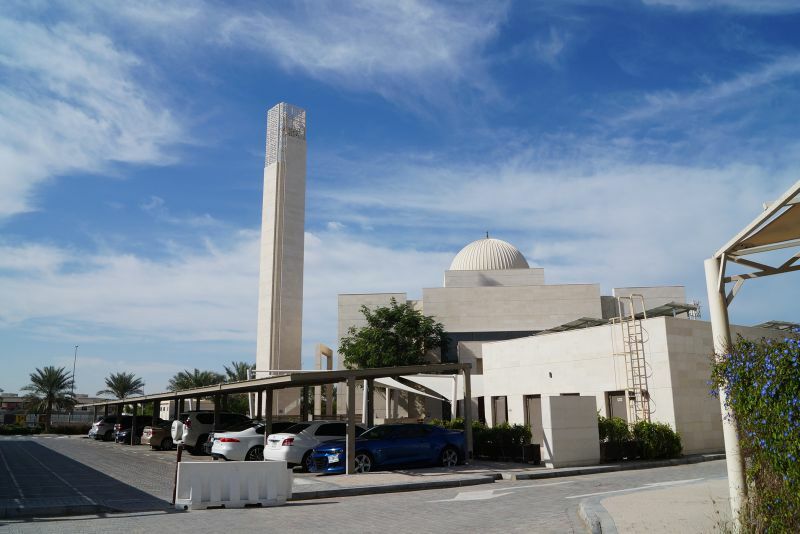 This state-of-the-art mosque is well insulated against thermal heat gain and is cooled using high-efficiency AC systems. The building is fitted with LED lighting. 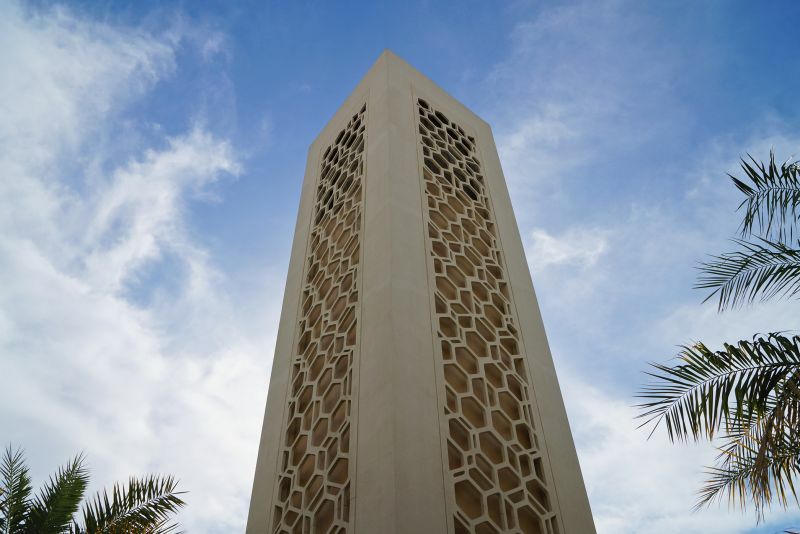 The mosque has solar water heating systems and uses water-efficient fittings and fixtures. All water from the mosque’s ablutions area is collected and treated using the city’s grey water treatment facility. In its quest to become a regional leader in eco-tourism and global environmental protection, Hotel Indigo is a Net Zero energy building where 100 percent of its energy needs are met by solar power. The Hotel is an unobtrusive, low-rise building surrounded by foliage. 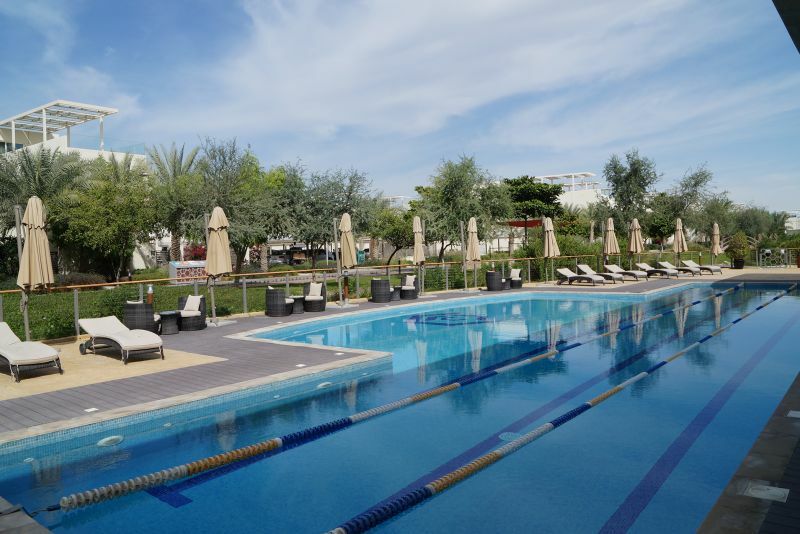 All waste water produced by the hotel is recycled, as is all material waste, to meet the highest environmental, social and commercial sustainability standards. Hotel Indigo’s soft opening at The Sustainable City is scheduled for early 2018. 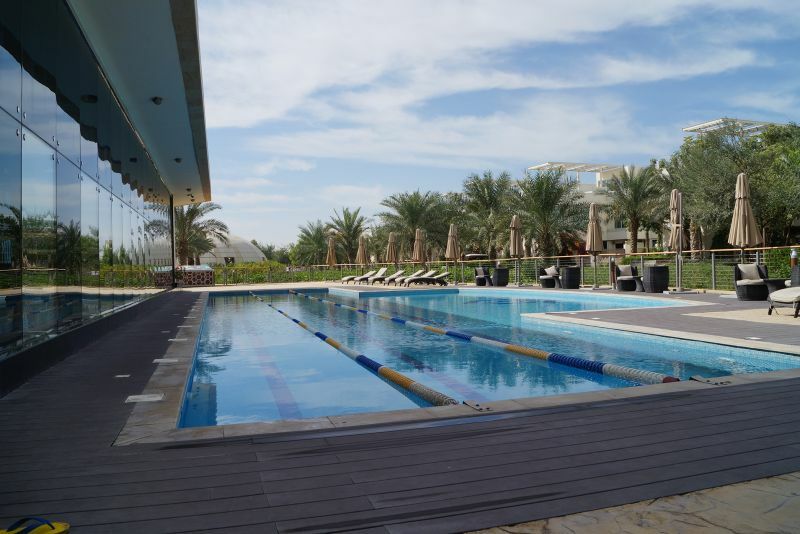 The Sustainable City Country Club is a world-class wellness destination comprising two main facilities; a 1,500-square metre rehabilitation hospital and a 1,430-square metre sports complex. It serves both residents and visitors. 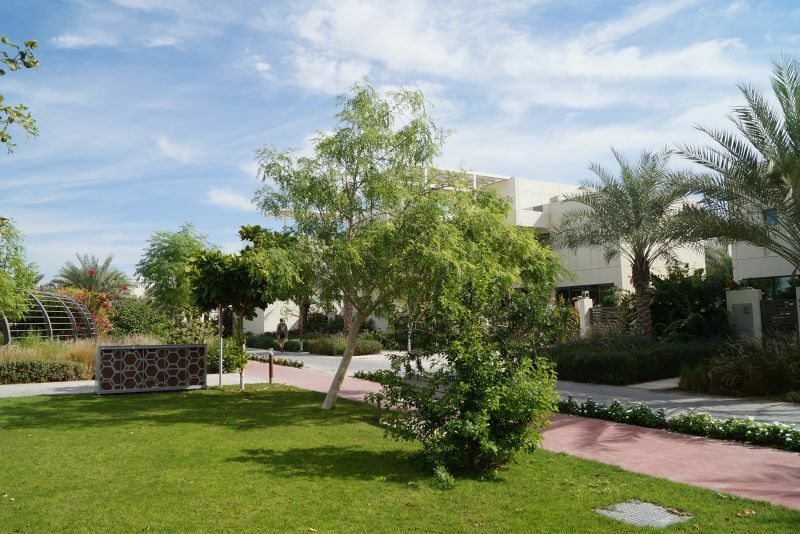 The green energy rehabilitation hospital is the first of its kind in the MENA region, and the first to offer medical tourism packages for all special needs, disabled and autistic children. 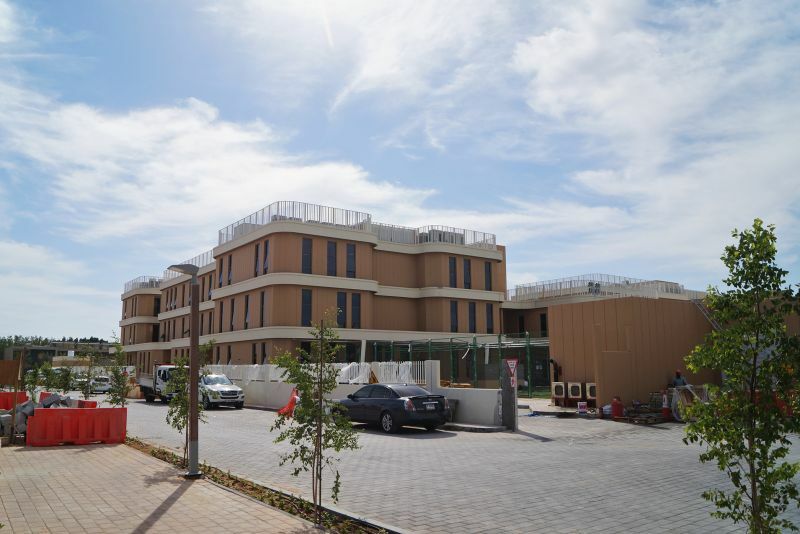 It has 30 inpatient beds to accommodate all paediatric special needs medical therapies, while the outpatient facility is the largest medical facility for physiotherapy, advanced rehabilitation, and the most advanced hydrotherapy systems in the MENA region. 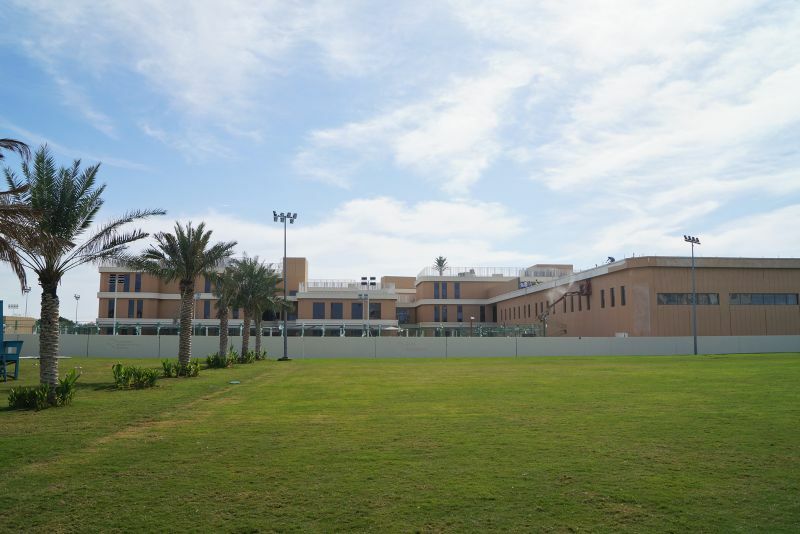 The medical facility is also able to accommodate surgeries for orthopaedic, ENT, plastic reconstructive, gastroenterology, sports medicine and other specialities. 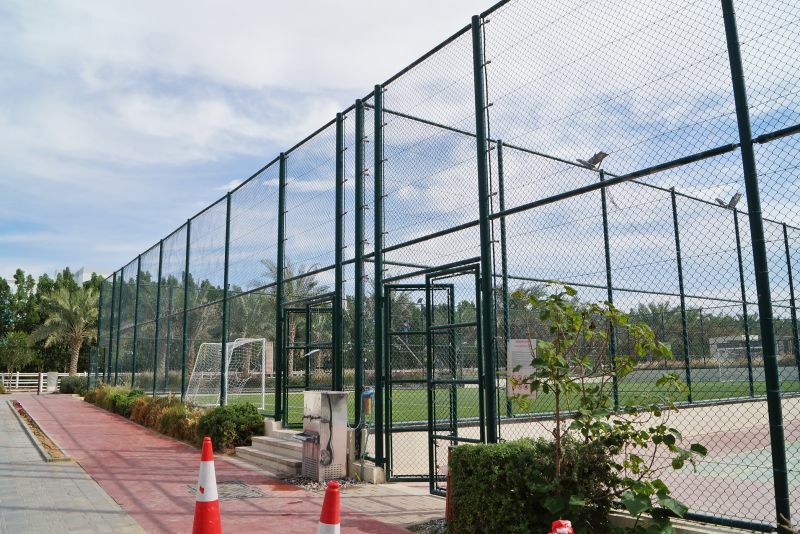 The Sports Complex includes a gym, sauna and Jacuzzi, tennis and basketball courts, outdoor fitness stations, and cycling and jogging tracks. 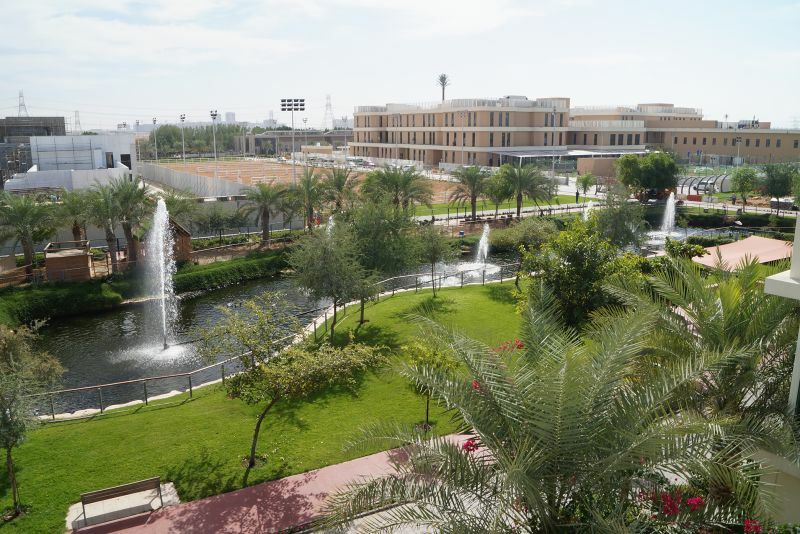 The Paediatric Medical Village (PMV) in Sustainable City provides a new patient experience, with the most diversified children’s medical facilities in the entire region. A comprehensive functional and natural medicine department. Child development and early intervention centre. 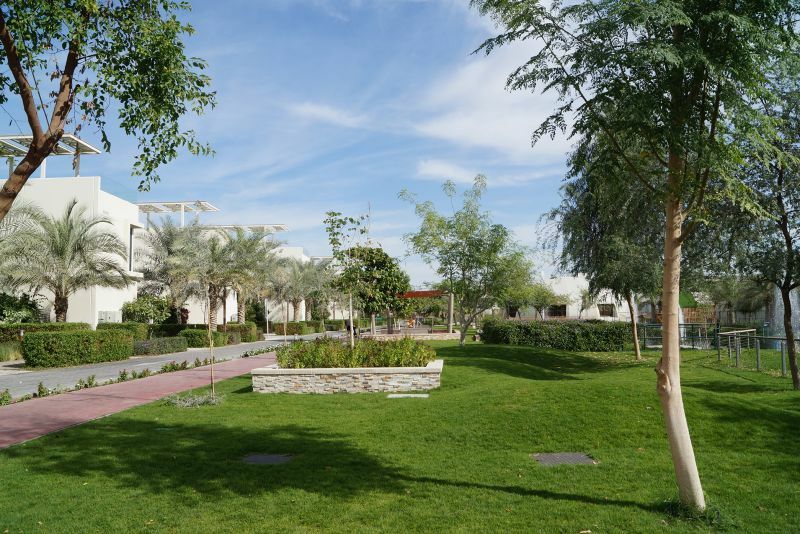 Being part of a sustainable community, the school will take advantage of the readily accessible healthy, safe, natural, outdoor, green spaces in the community. 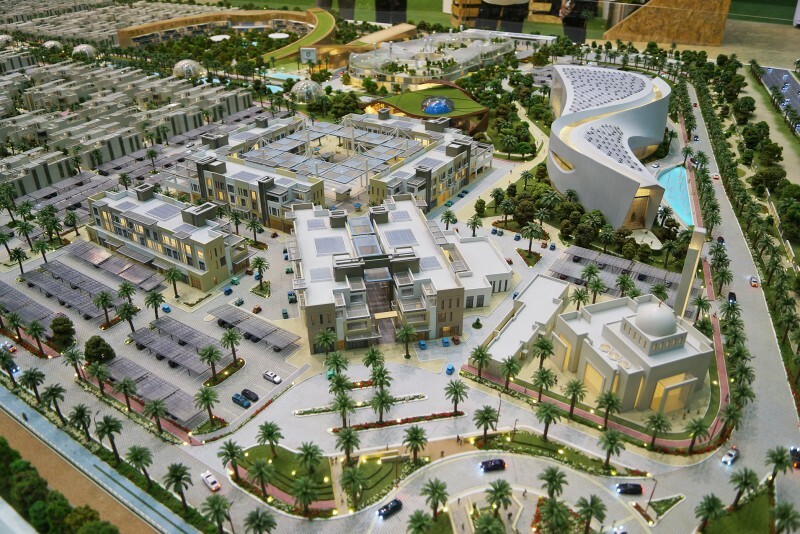 It will also integrate all the sustainable features already installed throughout the development. 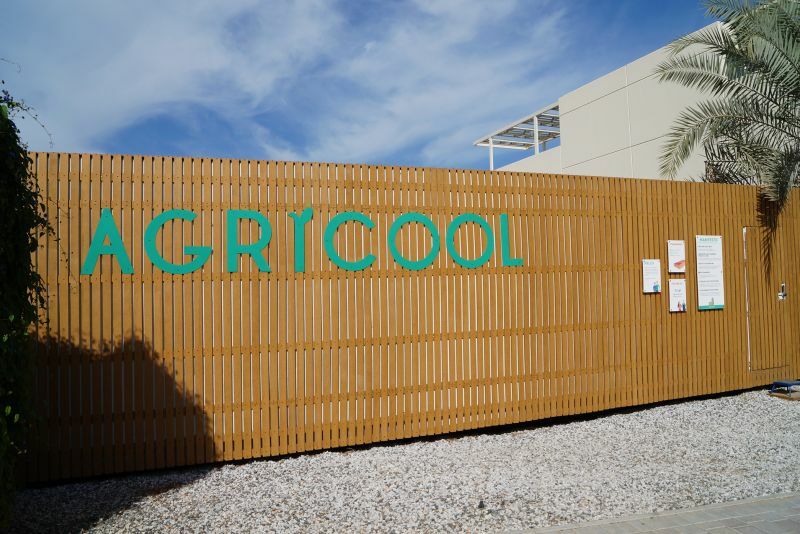 The design of the school will enable classrooms to open out to naturally cooled areas ventilated by wind towers. There will be shaded outdoor learning spaces using natural sunlight. 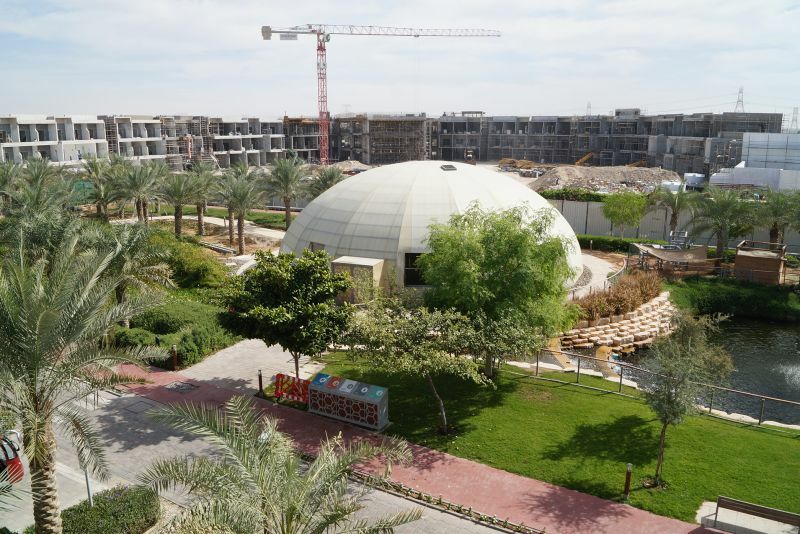 By opening the building structure towards the surrounding Sustainable City, the vegetation of the city will continue onto the school grounds, into the school itself and on its facades. 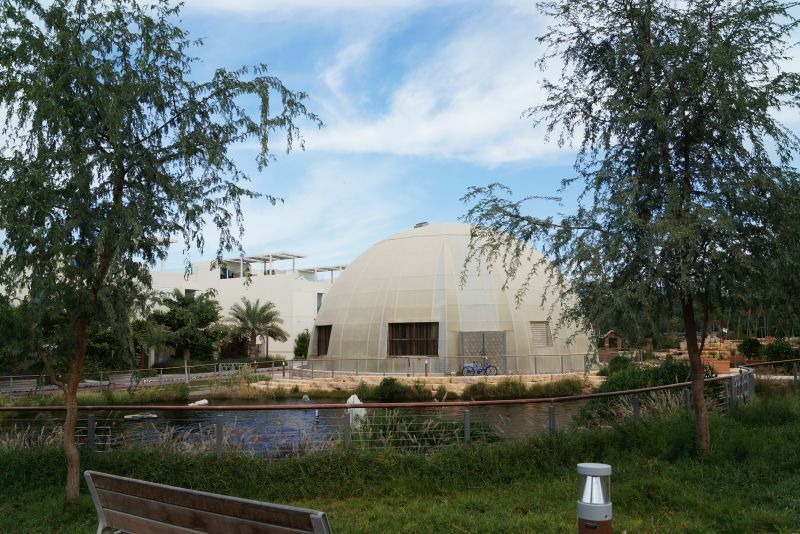 The school will make use of the various facilities in The Sustainable City, such as the bio-domes, Science Museum and Diamond Innovation Centre and will become a focal point within the community. Teachers will employ the most advanced technology and teaching techniques to develop the students’ basic skills as well as to enable them to appreciate and learn about their environment. Danish architectural firm CEBRA, together with landscape architect SLA, began developing the project in December 2015 with the aim of completing it in time for the September 2017 school year. 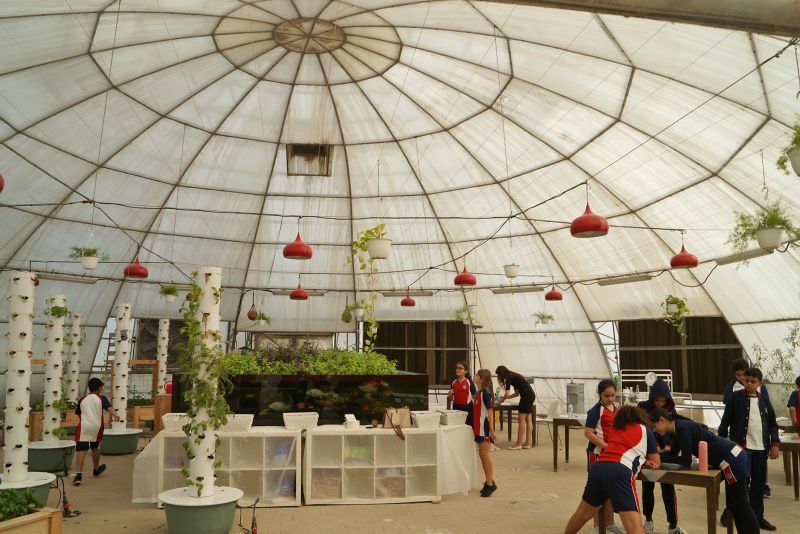 The Sustainable City Junior Innovation Centre is intended to create an informal educational environment that allows schools in the UAE to take a different approach when educating students about environmental issues. The Centre will be a unique and innovative experience centre with an intensive focus on sustainability and an exciting and diverse combination of indoor and outdoor hands-on activities and missions. The aim is to get children, young people, and adults to learn about new options and opportunities for the future. Content will be founded on classic science centre activities presented in a way that creates memorable, motivational experiences using engaging, interactive, installations. It is hoped that this facility will inspire children and young people – the decision-makers and citizens of tomorrow – to become excited about sustainable living and motivated to become into problem solvers. The Junior Innovation Centre will be a showroom for sustainability and a bridge-building project between The Sustainable City and the surrounding community. The Diamond Innovation Centre is the first Positive Energy Building in the region. This means that over its anticipated 50-year lifespan, the building itself will produce 140 percent of its energy requirement, thus offsetting emissions during construction, operation and decommissioning. This iconic building will be off-grid and provide a state-of-the-art amphitheatre for 700 people, as well as a spacious atrium for exhibitions. Through research and development, as well as dedicated conferences and exhibitions, this world-class institution will showcase the latest global advancements in sustainability. Training courses will be offered alongside advisory services to students and professionals seeking to broaden their knowledge in this rapidly evolving industry. Diamond Developers’ research program started in 2014 and has so far provided funding to a dozen research programs in partnership with the University of California, Davis and its network of partner universities in Lebanon, Egypt, and Palestine. 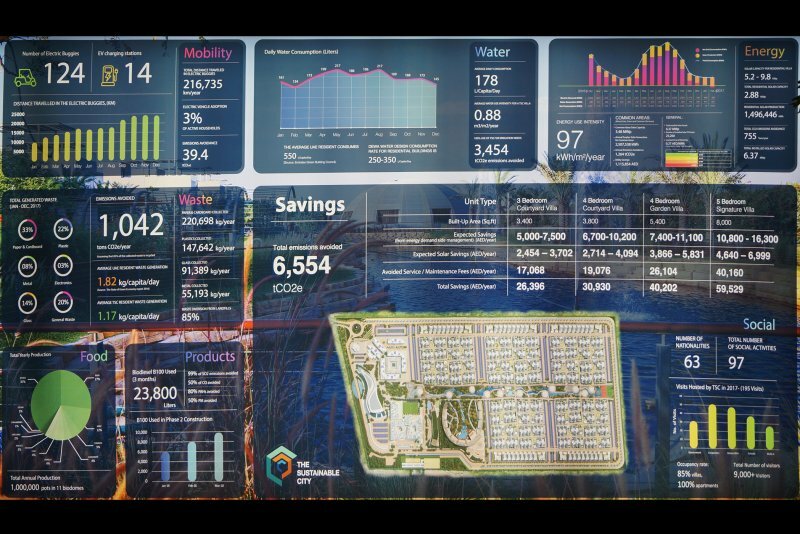 The Diamond Innovation Centre will house a “smart unit” which will monitor the city’s environmental performance and CO2 footprint, and support the publication of an annual Greenhouse Inventory. Construction started in 2012 and the first phase opened in 2015. 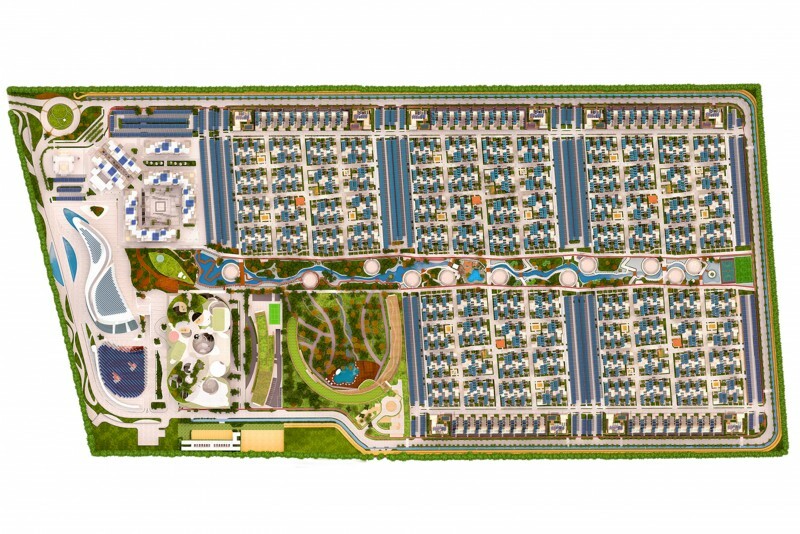 It comprises 498 villas, 89 apartment buildings, 11 dome greenhouses, 32,300 square feet of outdoor urban farms, and 1.16 million square feet of office and retail space. 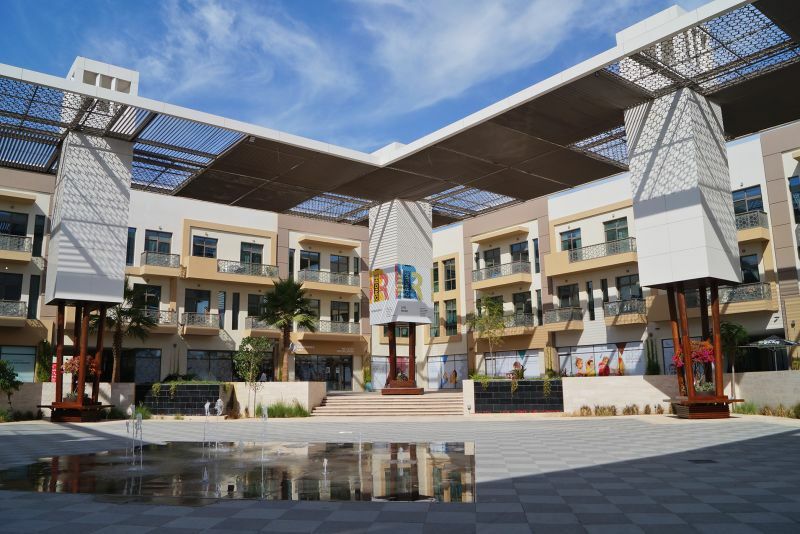 The second phase includes a school and a mosque, which are completed, as well as a science museum, a hotel, a country club and a mall which are under construction. 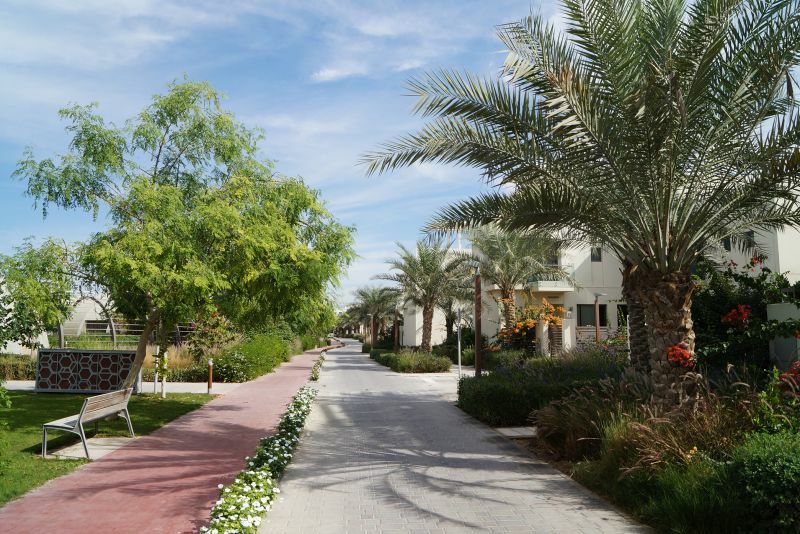 We currently maintain records for 5 sub-communities in Dubai Sustainable City. 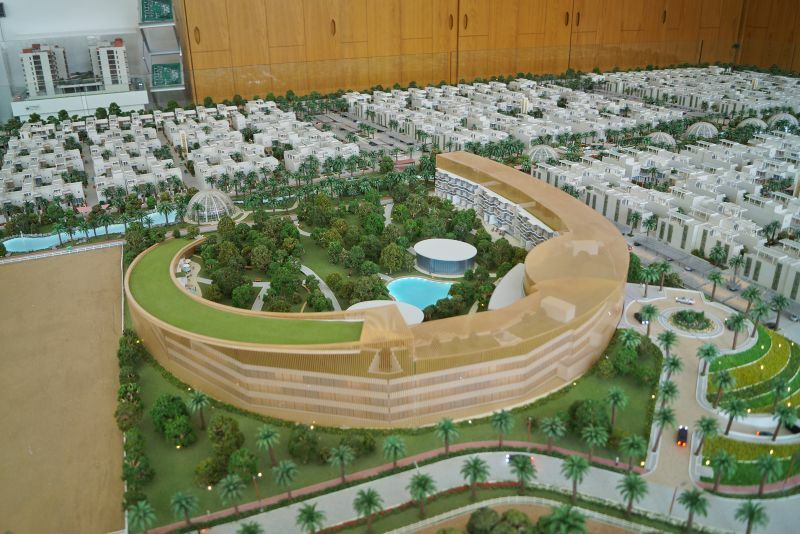 We currently maintain records for 3 building developments in Dubai Sustainable City. 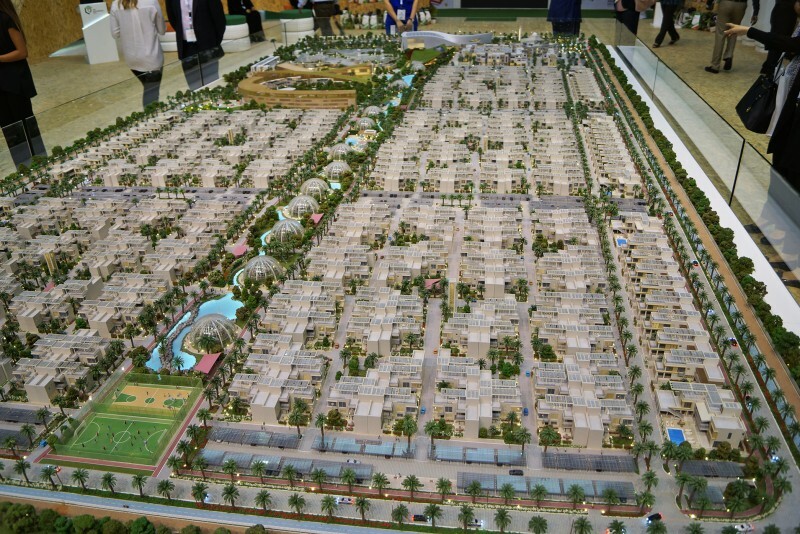 View all Dubai Sustainable City building developments.